Standing at 1,100 feet in a sprawling 64-acre tea and rubber estate, The Rosyth Estate House is a majestic property that dates back to 1926. Containing 10 finely appointed bedrooms, spacious communal areas and sun-dappled grounds, the estate lends itself to large travelling parties. Beyond getaways with friends and family, Rosyth Estate House is also ideal for hosting yoga retreats. Ten bedrooms comfortably accommodate 20 guests at Rosyth Estate House. The bedrooms are classified into four categories. Classic rooms, like the Clove or Mango room are located in the main building. These rooms offer a combination of double, twin and triple bed options. The classic suites (Palm and Cardamom) are adjoining bedrooms that share a bathroom. These suites are best suited for families. Cinnamon, Coconut and Lime are deluxe rooms. Featuring larger interiors, the rooms come fitted with spacious ensuites with twin vanities and outdoor spaces. Coconut and Lime are adjoining bedrooms, while Cinnamon offers wheelchair access. Tea and Pepper are plantation suites with stunning views, indoor and outdoor living spaces, and outdoor bath on the balcony and terrace. Both suites are interconnected, and are located away from the main building. 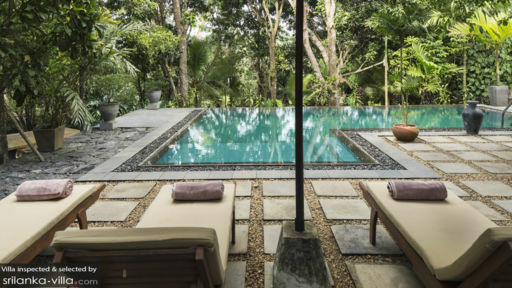 While the other two suites, Rock and Banyan located approximately 150 meters from the main house. Spread out across an expansive land area, the Rosyth Estate House features a swimming pool, sun terrace, outdoor sala, terraced gardens, organic garden, badminton court, mountain biking routes and walking trails. The property also serves as a working estate, and extends out to include a rubber plantation and paddy fields. Spend your days relaxing by the pool, taking in the postcard-perfect surroundings or basking under the sun at the terrace. Follow the trail heads for a guided estate walk with Subramanium, the superintendent of the property. The walk is a great way to discover the rural Sri Lankan life; you’ll make your way past the villages, as well as paddy fields, jungle and streams. An elegantly furnished living room, decorated with antique pieces and local artwork is where most of the socialisation takes place. Adjoining the living area is a library kitted out with a collection of books, DVDs and satellite TV. Meals are enjoyed at the dining pavilion - a gorgeous, wood-clad room that seems to float off the edge of the lawn. Flanked by full-length windows, the light-filled pavilion offers unobstructed vistas out to the rolling hills and verdant greenery. Breezy, sun-drenched verandas extend out from the front and back of the building, providing vacationers with a cosy nook to unwind and take in the villa’s incredible surroundings. Guests enjoy impeccable service at Rosyth Estate House. What makes the property stand out are its in-villa dining experiences, cooking classes, yoga lessons and spa treatments. An emphasis is placed on fresh, authentic flavours. All meals are prepared with home-grown produce from the estate’s organic garden. A private chef will meet with guests to discuss a customised daily menu. Cooking lessons and demonstrations, featuring fusion and local recipes are also available at the property. Advanced booking is recommended. A complimentary introductory yoga class is available at 7.30am each morning. Private lessons may also be arranged. Nestled away by the Lime and Coconut rooms lies the Rock Spa. The spa menu offers a small selection of treatments, which are administered by on-site therapists. Rosyth Estate House enjoys a prime hillside setting located 10 minutes’ drive away from the town of Kegalle. Take your pick from a wide-ranging array of activities - from walks and mountain biking within the estate, to visiting nearby attractions or making day trips out out to iconic Sri Lanka attractions. Located a skip away is a local tea factory. Guests are welcome to visit the factory for a tour that takes you through the various tea production processes. Further out are attractions like Kandy (the city boasts a scenic lake and cultural attractions), Bible Rock, Victoria Golf Club and Kitugala (it’s one of the best locations on the island for white water rafting). About a two-hour drive away from the property lies the Dambulla Caves, a temple complex known for its 14-metre Buddha statue and striking wall paintings. There’s also Adam’s Peak, the rock fortress of Sigiriya and Minneriya Safari. Even thought the Rosyth House is based in Kegalle, this is just an hour from Kandy, so it is an excellent base for Kandy sightseeing. It is also just 15 minutes drive to Pinnawala Elephant Orphanage. 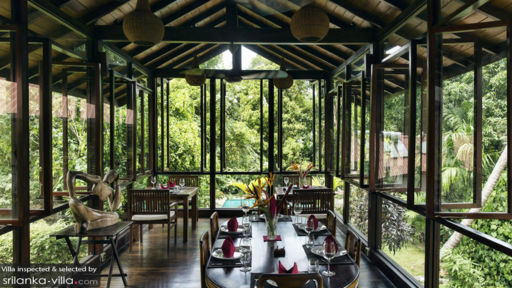 This luxurious boutique property is located up in the hills and is surrounded by a tea plantation. The rooms are spacious and extremely comfortable.The gardens surrounding the hotel are magical and peaceful. As we had just 2 nights to spare and we wanted to visit Kandy, as well as the tea country, we picked the Rosyth, because we could combine both activities while staying here! 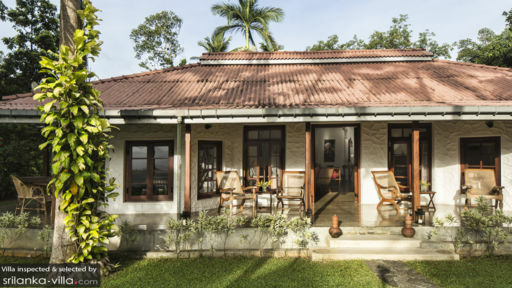 If you want a luxurious hideaway, and you love nature, as well as Excellent food and service, with stylish rooms, as well as being not too far from Kandy, and to get a taste of the tea plantations, then this is the Ideal place for it! We loved this place! After a fairly extensive tour of the island, it was wonderful to stop at this peaceful estate, spend time relaxing on the veranda admiring the views across the valley and hills beyond. A truly authentic and genuine Sri Lankan experience. Tastefully decorated - each room is beautiful. The addition of A/C (it arrived this week I believe!) will be welcomed by many, but for us it didn't matter as the windows can be thrown open and every room has a ceiling fan. I would recommend Rosyth to anyone. Our family fell in love with it and their interconnecting room option was perfect for us. The library has an excellent selection of books - must read Michael Ondaatje (of English Patient fame) Running in the Family - as has historical connections to Rosyth and the Kegalle area. Fascinating. The staff could not have been more helpful and adaptable. I could go on - - but if you like peace and tranquillity and good food you can't go wrong here. And its only an hour or so from exploring Kandy (far too busy there to bother staying!) and an easy journey to Colombo or the airport - making it a great first or last stop. Thank you Delantha and your staff. I will never forget the Egg Hopper breakfast! We spent two nights here in March 2015 , arriving after a long flight ! Dilantha and his team welcomed us and were so attentive but never intrusive. Everyone was so kind and helpful.The chef and his food were amazing and the best we had in Sri Lanka . The children adored it there and none of us wanted to leave ! Rosyth Estate is set in the stunning surroundings and has a sense of calm and serenity.The rooms were beautiful, My only regret is that we were unable to stay longer ! We hope to return and stay longer next time.